Our wood fence installers have plenty experience to get the job done right. 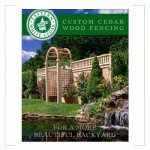 All Island Fence & Railing offers a wide variety of Wood Cedar Fence styles for your home or business. Cedar is one of the most stable woods available and will stay straight and warp very little throughout its life time. The panels can be full privacy panels, picket fencing or semi privacy panels that allow you to add decorative toppers to your fence. If you desire a more natural look, Cedar wood fencing is ideal choice. It also blends in better with the general natural landscape. As a wood fencing company here on Long Island, NY we still encounter plenty of homeowners who want to add a more natural, rustic feel to their home. Cedar wood Fencing is not a maintenance free product, we recommend staining/treating the fence at least once a year to expand its lifetime. Our wood fence installers will also help customize your wood fence, so if you have a style or design in mind just show it to our sales consultant. We will be more than happy to create something unique for you. All Island Fence & Railing also offers spruce stockade as another wood fence option for your home or business. Spruce stockade is one of the most economical privacy fences available, it is made from untreated spruce lumber and even though the longevity, strength and versatility of this product is not as good as a cedar wood fence but if maintained properly it can make a great fence for years and years. 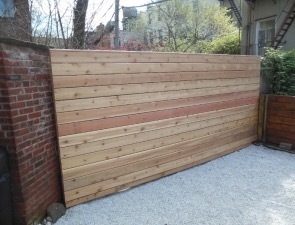 If you need a budget friendly fence make Spruce Stockade your fence decision. We encourage you to browse through our wood fences gallery and also view the wood brochure so that you can see all the different options available.